What Day Of The Week Is October 26? 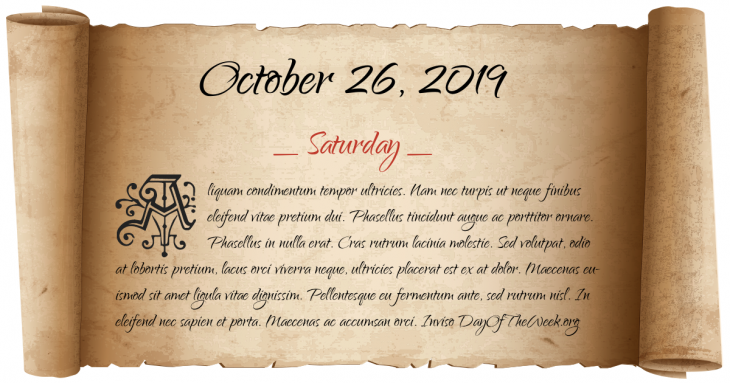 October 26, 2019 is the 299th day of the year 2019 in the Gregorian calendar. There are 66 days remaining until the end of the year. The day of the week is Saturday. The Royal Charter is wrecked on the coast of Anglesey, north Wales with 459 dead. The Gunfight at the O.K. Corral takes place at Tombstone, Arizona. World War I: Battle of Caporetto; Italy suffers a catastrophic defeat at the forces of Austria-Hungary and Germany. The young unknown Oberleutnant Erwin Rommel captures Mount Matajur with only 100 Germans against a force of over 7000 Italians. Erich Ludendorff, quartermaster-general of the Imperial German Army, is dismissed by Kaiser Wilhelm II of Germany for refusing to cooperate in peace negotiations. The Maharaja of Kashmir agrees to allow his kingdom to join India. Ngô Đình Diệm declares himself Premier of South Vietnam. The Charlottetown Accord fails to win majority support in a Canada wide referendum. The London Ambulance Service is thrown into chaos after the implementation of a new CAD, or Computer Aided Dispatch, system which failed. Israeli-Palestinian Conflict: Mossad agents assassinate Islamic Jihad leader Fathi Shikaki in his hotel in Malta. The Cedar Fire, the second-largest fire in California history, kills 15 people, consumes 250,000 acre, and destroys 2,200 homes around San Diego. Who were born on October 26?